The Northern province of Akita was especially hit hard by the Temple. Due to the efforts of the priests, some members there actually left SGI to become direct temple members. 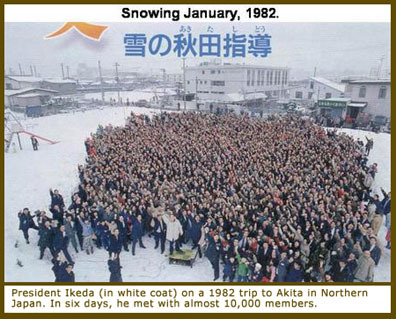 Daisaku Ikeda decided to visit in 1982. It is a remote area and planes rarely land. Many of the local members heard that Mr. Ikeda might be visiting and figured out on which plane he would arrive. So when he was driven into town, there were Soka Gakkai members lining the route. President Ikeda was so touched by the warm welcome that he got out of the car numerous times to shake hands and take pictures. Many members from Akita treasure those photos. The captions for some of them read "Discussion Meeting in the Snow."